Is a multigenerational home right for you? It may be. Family can be a great source of strength and vitality. Family can be our safe port in a stormy sea. For parents with demanding work schedules, knowing that your children are with grandparents may put your heart at ease. For some families, the flexibility gained by sharing expenses and household jobs allows for a higher quality of life, while for others living together provides more opportunities to pass down family values, and help care for each other throughout the later years. There are many reasons to explore whether a multigen home is a good answer for your family, and Artisans Group can help you throughout the process. Our experienced and award winning designers and builders listen to your family’s needs so that we can build you a custom home that works for your family’s lifestyle. The U.S. Census Bureau narrowly defines a multigenerational home as “family households consisting of three or more generations.” Pew Research’s more expansive definition includes all households with two or more adult generations (adult being over 25) living under the same roof. No matter which definition you decide to use, though, the number of multigenerational homes in the U.S. is rising and looks to return to pre-WWII levels. The times, they are a changin'...or maybe it’s a return to form. 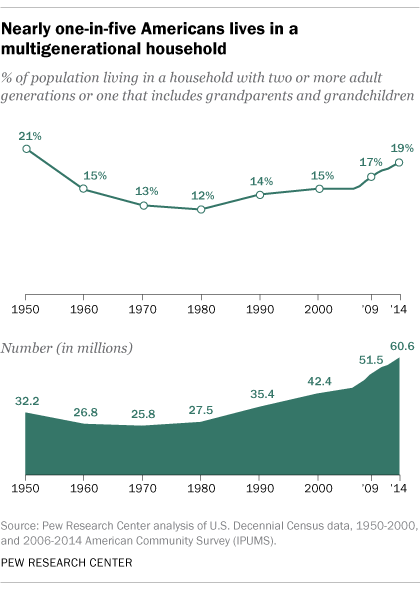 In August of 2016, Pew Research published an analysis of U.S. Census data showing that, as of 2014, 60.6 million Americans live in multigenerational households. 60.6 million people represent about 19% of American households, are an increase of 11 million people from 2009, and bring us closer to the 21% of American multigenerational households recorded in the 1950 Census. While many people point to the 2007-2009 Great Recession as a primary driver of this increase, the overall number and percentage continue to rise even as Americans’ economic prospects improve. While we don’t profess to have the answer(s) to the why of this matter, we too see an increase in interest for multigenerational homes and their complex program of needs. With planning and care, a multigen home can work beautifully. We are currently putting the final touches on a lakefront multigen home in the Seattle area tailored to our clients’ family. With priorities that include a traditional yet modern Queen Anne style home, community areas for gathering and working together, a kitchen suitable for many helping hands, ease of lake access for everyone, sound dampening floors and walls to allow quiet contemplation (even while kids play), aging-in-place design considerations, and a floor plan conducive to privacy as well as community; this home has been a wonderful opportunity for our clients to utilize our skills to design and build the home their family needs. If you are considering a multigen home, contact us. Our experience can help you build a custom home perfect for your family.